DALLAS – April 6, 2017 – Komen Dallas County raised $19,790.92 with its inaugural BigWigs campaign. The six week campaign ran February 20- March 31. 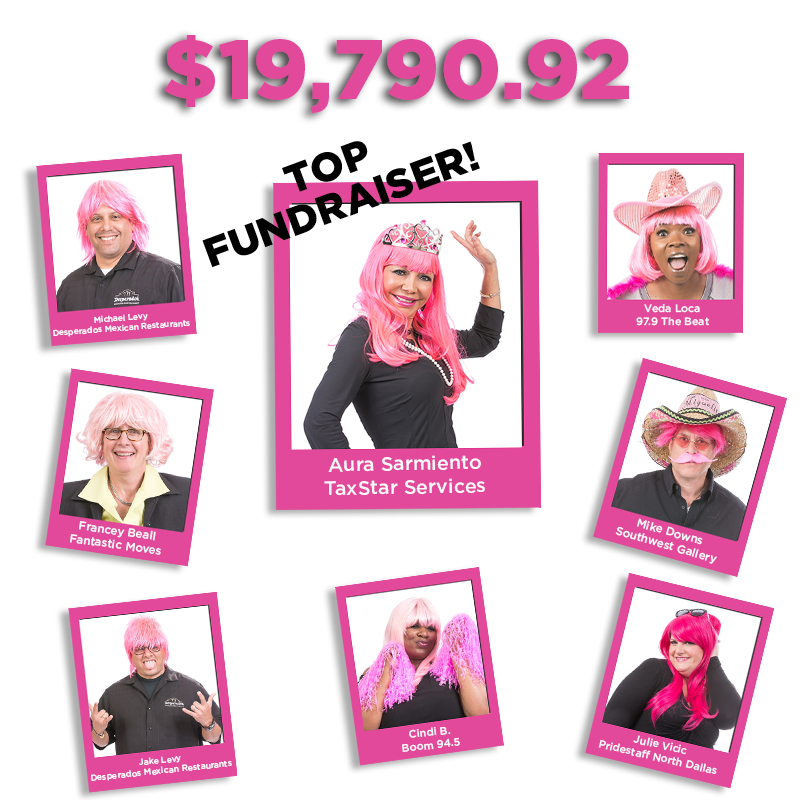 During this timeframe eight Dallas business and community leaders were asked to don a pink wig while raising funds for the cause. The fundraising goal was $16,000 and the Komen Dallas County BigWigs more than exceeded it. Participants included: Jake and Michael Levy, owners of Desperados Mexican Restaurants, Julie Vicic, Strategic Partner for PrideStaff North Dallas, Aura Sarmiento, owner of TaxStar Services, radio personalities, Cindi B. and Veda Loca from Boom 94.5 and 97.9 The Beat, Francey Beall, owner of Fantastic Moves, and Mike Downs of Southwest Gallery. The BigWigs campaign was a fresh take on fundraising while also being a competition between the participants. Each BigWig wanted to raise the most funds for the cause and take home the top fundraiser trophy at the end of the six weeks. Each of the BigWigs put a creative spin on fundraising, but in the end Aura Sarmiento, owner of TaxStar Services, came out victorious. Aura raised $3,318 with the help of her family, friends and TaxStar clients. She had a collection jar decorated with pink ribbons on her desk, and she wasn’t shy about asking everyone for a donation. “I had cancer and I want to help everyone, especially Latin women, prevent and inform themselves about the importance of early detection to reduce risks, and improve the rate of success. I personally know that cancer does not discriminate due to race or social class.” Aura explained why this cause is so important to her. Komen Dallas County is thankful for each of the participants in the BigWigs campaign, as well as everyone who donated. The success is contributed to the BigWigs’ dedication to the cause and their willingness to give it everything they had. The BigWigs Class of 2017 set the bar high for the next BigWigs class as Komen Dallas County looks forward to making this an annual campaign. For more information on the success of each individual BigWig visit www.info-komen.org/DallasBigWigs. Komen Dallas County is committed to Dallas’ fight against breast cancer. Since its inception, Komen Dallas County has invested more than $23 million in local breast health programs providing education, screening, diagnostic treatment, patient navigation and transportation services. Komen Dallas County has also invested over $7 million in national, cutting edge research to find the cures so that future generations will not have to face this devastating disease.